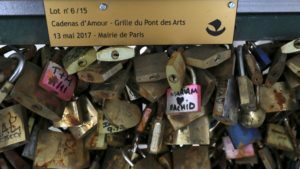 On May 13th 2017, the City of Paris is organizing the auction of « Cadenas d’amour du Pont des Arts« * to the benefit of associations working for refugees. The batches of love padlocks will be on display at the Crédit Municipal de Paris from May 10th so that curious onlookers and potential buyers can identify their future acquisitions. Several hundred thousand padlocks were hung on Parisian bridges, causing two major problems: a lasting degradation of the heritage and a risk for the safety of visitors, Parisians and tourists. The City Hall of Paris has therefore launched their final withdrawal in June 2015. Remember the love locks bridges of Paris before this fateful date of June, 1st, 2015. For many lovers from all over the world, they were in charge to keep their testimony of love forever. The lovers had placed all their confidence in this city with multiple references to love. Millions anonymous lovers and numerous famous lovers had been seduced by this romantic tradition. See this one engraved with “Michelle and Barack, Love Forever”. If someone who reads this article knows a couple named Michelle and Barack, please tell them that I have rescued their love lock among about 800 other antique padlocks. Since around 2007, the love padlocks, engraved and in charge of a mission, have given a romantic and luminous atmosphere to these unmissable places to be in Paris. And if “Paris sera toujours Paris”*, the tourists visiting the French capital can’t understand why they cannot perpetuate this tradition. If Paris remains one of the most romantic cities of the world, its epicenter is lacking. Love requires a spot to accumulate and spread its halo all around this world that needs it. For the moment, if you want to buy a batch of anonymous love padlocks, be present on May 13 in Paris or if you really live too far, ask me to be there for you. I will be your agent.